Macau (Macao) – January 16, 2019 (travelindex.com) – This spring, Wynn Palace will unveil a stunning new restaurant – Sichuan Moon – in partnership with award-winning Chef André Chiang. In his role as Culinary Director, Chef André will present the essence of Sichuanese cooking in a contemporary way, revealing his own unique interpretation of the cuisine. In 2018, Chef André received two prestigious awards for his masterful culinary work – The 15 Most Influential Chefs of the Next Decade by Elite Traveler and The Diners Club Lifetime Achievement Award from the Asia’s 50 Best Restaurants Awards 2018. Chef André says his passion for creativity stems from his very own DNA, as he was born into a family of artists. Although originally from Taiwan, he spent his formative years in France where he began cooking at just 13 years of age. When he turned 20, he moved to the South of France where he immersed himself in skills and techniques of French cuisine. Then at the age of 25, he joined the three Michelin-starred Le Jardin des Sens, where he elevated his cooking further. Armed with an array of culinary experiences, Chef André went on to open a number of exceptional restaurants of his own in Singapore, Taipei and Paris which include the award-winning Restaurant ANDRÉ , Burnt Ends and RAW. Restaurant ANDRÉ received two Michelin stars and was ranked #14 on the World’s 50 Best Restaurants list and #2 on Asia’s 50 Best Restaurants list in 2017. The one Michelin- starred Burt Ends is ranked #12 on Asia’s 50 Best Restaurants 2018 list. 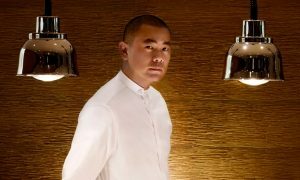 His Taipei restaurant RAW, a Michelin-starred establishment is ranked #15 on Asia’s 50 Best Restaurants list in 2018. More recently, he also established The Bridge restaurant in Chengdu, China. Throughout the course of running his own restaurants, he has successfully created his own unique cooking style and earned worldwide acclaim for his achievements. The opening of Sichuan Moon in partnership with Chef André is another milestone in the continued recognition of Macau as a global dining destination and a “Creative City of Gastronomy”. Wynn Palace is the second luxury integrated resort from international resort developer Wynn Resorts in the Macau Special Administrative Region of the People’s Republic of China, following the launch of Wynn Macau. Located in the Cotai area, it features a 28- storey hotel with 1,706 exquisitely furnished rooms, suites and villas, versatile meeting facilities, over 106,000 square feet of renowned luxury retail, 11 casual and fine dining restaurants, Macau’s largest spa, a salon, a pool and approximately 420,000 square feet of casino space. The resort also features a variety of entertainment experiences, including the dazzling 8-acre Performance Lake that mesmerizes guests with a choreographed display of water, music and light, the unique SkyCab, spectacular, large-scale floral displays by renowned designer Preston Bailey and an extensive collection of art works by some of the world’s leading artists.